Look at this old residence. There are stories that occurred within this home’s walls, but in the viewer’s world these stories don’t exist. We tend to pass by old homes because we don’t give much thought to the human history of the place. Maybe we think the people who lived here were just like everyone else. Or perhaps we don’t think of them at all. 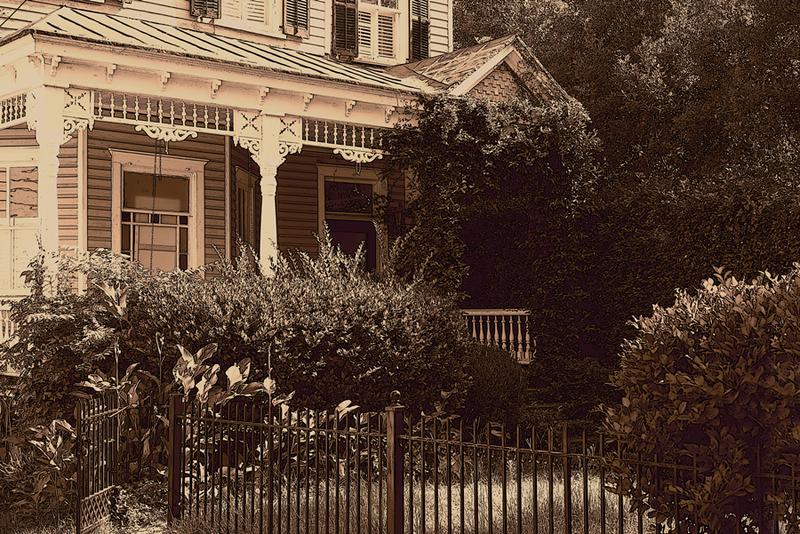 If the families who lived in this dwelling behind the scraggly vines—this Hidden House—weren’t famous, or of blood relation to us, then why should we be interested in their past? We could say it’s like owning a particular object—say, a stapler—but having no awareness of it. What if you’d inherited a small box of stuff and you’d stored it in your basement. Let’s say a stapler’s in that box. Since you don’t know of the stapler, or you once knew but had forgotten about it, the item is essentially a non-entity. It doesn’t matter that you happen to own the stapler, because in fact, you do own it. But if you needed papers bound together tonight, you’d have to buy or borrow one. You don’t know of your basement stapler. It doesn’t exist in your world, and yet, it does exist. Are you with me so far? Let’s take a look at Hidden House again. The stories that originated at this address are the “unknown staplers” of a family’s life—the lives of many families. But so long as the historical anecdotes remain out of our sight, the goings-on do not exist to us, the stranger. Most likely, we can’t call upon the previous owners’ accounts or investigate their details. Until a person steps forward to talk to us, or a document is discovered that reveals the people who lived here, there is not much for an observer to hook onto. So to us, when we look at Hidden House, there’s nothing. But yet, there was something. The occupants’ activities are memory boxes of a sort, long thrown away. What’s important for the casual observer to grasp is the massive weight these boxes carried. After all, pre-and post-Victorian-era people lived here, so by default their lives were linear. Vintage life tended to string activities together like beads. Often, one event had to come and go before another was managed. This linear concept applied to nearly every household. Information and activity tended to flow in and out of homes in a simple, consecutive fashion. A person’s linearity was like an endless private tape measure, with accumulated rolls of activities instead of inches and feet hash marks. The spools of these tales were lost; how could they not be? Unless someone kept a detailed diary, there were no means to record or preserve the comings and goings of Hidden House. But we can believe that many interesting adventures took place in this home. How do we know this? Why should we care? If history hasn’t noted anyone of merit in Hidden House, why should we be concerned with its generations? How can we be so sure interesting events took place here? Weren’t most people’s lives routine and unremarkable? If we tend to slight the value of drama in commonplaces, it’s because we aren’t aware of the depth of content that’s present just about anywhere, given the nature of people and the course of time. So long as there were folks living and working their days and nights, there would be accounts we’d be interested to know. We have a lack of interest because we don’t know what went on, not because what went on wasn’t interesting! Their arcs would engage us. We’d see a twist of ourselves in them, or we’d marvel at a different social value system. But—like the stapler—we don’t know we’re missing these stories. So we go out and buy others. We consume what’s packaged for us. We make our way to book stores or online, and pursue what’s neatly written and placed upfront, fiction and fact. There’s no fault or blame in our doing so. Consider this. Someone starred in Hidden House. A good guess would be that there were many stars involved at this address. Maybe someone fell in love, or worked themselves to exhaustion on too many days. Perhaps someone gave up on a precious dream, or cashed out their savings, so that another person could enact a dream of their own. Someone was not free; others had too much freedom. One thing I’ve learned is that reality exceeds imagination. It’s hardly documented—no one’s kept their spools of routine—but the sheer weight of numbers backs this. Another lesson I’ve learned: Entertainment is about storytelling. I think we’d find delightful interest in Hidden House’s personal accounts if the stories were told to us, just so. If we broke the linearity down to a contemporary meter, and edited-out the repetition of which we need not be bothered, then we’d have the basics of a good story. A gift-bearing child walking to a friend’s house may carefully alter his route to avoid the local bullies—and then there’s a bully standing on the friend’s street corner. Human drama need not be epic to be interesting. When I look at this Charleston house, I see old wood siding and shutters, with layers of leaves that reveal advanced age. Who dreamed, and desired, and laughed here? Who cried? What was the source of their strife, and how close was their solution? Who built this home, who toiled in it, what were their ambitions, how did they view the world? We don’t know what we’re missing, in Hidden House. This entry was posted in History, non-fiction. Bookmark the permalink.